The September 2012 release of the revised and updated edition of my Love Your God with all Your Mind book has been greatly needed and anticipated. It is available in paperback and as a Kindle version. The original 1997 version of Love Your God With All Your Mind was one of my bestselling books. It came out just a few years after Christian historian, Mark Noll, wrote his infamous book, The Scandal of the Evangelical Mind (Eerdmans, 1994), where he opened with these words: “The scandal of the evangelical mind is that there is not much of an evangelical mind” (3). Indeed, that was not too far from the mark at that time. Noll provided a historical-cultural treatment of the problem. Others have approached it differently. In some sense, my book tries to reckon with that “scandal,” but insofar as that scandal is among individuals and not merely cultural or historical phenomena, I think it is a scandal related to inadequately integrating and cultivating “the role of reason in the life of the soul,” which my subtitle suggests. In other words, the “scandal of the Evangelical mind” is a problem related to discipleship. Since its original publication, Love Your God with All Your Mind has had an impact for the cause of Christ that goes considerably beyond anything I could have imagined. It would be a significant understatement to say that I am grateful to God for this fact. Over the last 15 years, I have been deeply encouraged by the outpouring of support from readers all around the world for this book. It is moving to me to have readers from different vocations and seasons of life find this book to be supportive to their life in God, whether they are parents, educators, professionals in business, science and medicine, pastors, students and so many others! In my estimation, the majority of the first edition’s content is as relevant today as when it first appeared in print. But some updating was needed and, in my view, the reader could be better served by changing a few of the chapters. So I wanted to offer a revised and updated version of the book. In chapter 1, I added a brief section about the current three-way worldview struggle in Western culture. In chapter 2, I have included a new section on the nature of knowledge and its importance to Christianity. Chapters 7–9 of the original have been removed and replaced with three new chapters providing an outline of how to present a case for God’s existence and the historicity of the life, teachings, deeds, death, and resurrection of Jesus of Nazareth. No author likes to remove material from his or her writing, and I am no exception to this rule. But, in my opinion, chapters 7–9 of the original edition, though useful, were not as helpful as the rest of the book. The appendices, which provide further resources for cultivating an integrated Christian mind, have been thoroughly updated and expanded. I am deeply indebted to Joe Gorra for his work on the appendices. Finally, you can download a FREE and helpful book discussion guide, which has also been developed by Joe Gorra. I encourage you to utilize this guide, whether for individual or small group purposes. When you combine the book, the resources recommended in the appendices and then the discussion guide, you have, in my estimation, a valuable context for self-learning in a variety of areas and themes addressed in this book. Download a FREE PDF sample of the book here, or send a sample to your Kindle. I welcome your reviews of the book at Amazon.com, Barnes & Noble, ChristianBooks.com or at any other favorite places to shop. If you blog or enjoy posting on Facebook or Twitter, I would be very grateful to have your support and help in announcing this new edition to friends and acquaintances. At the time, my book was originally part of a newly developed “Spiritual Formation Line” of books with NavPress. Dallas Willard, my dear friend and mentor, was the General Editor of the series and I was blessed to have him also write the General Introduction to the book. In my acknowledgments I said, “My prayer is that this book will contribute to restoration of the church’s intellectual life because it is the church that is the pillar and support of the truth.” I believed that then and I certainly believe that now. Jesus’ church, His Bride, is the chief steward and stakeholder of the “Christian mind.” As disciples of Jesus we have the resources to discipline the mind under the direction of God and His kingdom. Thus, in four basic parts, I try to show how and why the mind matters to Christianity, how to develop a mature Christian mind, what such a mind looks like, and how we can guarantee a future for the Christian mind in our churches throughout the world. In chapter 1, I provide a snapshot – which Noll describes in great detail – “how we lost the Christian mind and why we must recover it.” Short answer: We lost it because we permitted “faith” to be discussed and thought of as a concern independent of knowledge. Not accidentally, that orientation coupled with an emphasis on faith as merely a personal and private matter, helped spawn anti-intellectual currents in our midst. A disasters move especially in the wake of a growing, advantageous secular culture! Our default posture: withdraw and retreat. Net result: Christianity is marginalized from centers of social-cultural and institutional power. Chapter 2 and 3 are essential discussion about how to think biblically about the life of the mind and its role in spiritual transformation. My experience has been that a decent amount of people understand that the mind, reason or knowledge is at least talked about in scripture; they may then reason that this has value because the Bible shows it to be valuable. But more often than not, I’ve found that people don’t know what to do with such facts in light of human maturation and spiritual transformation. That’s why in many ways my chapter 3 is the heart of my book’s thesis. We can know the mind’s role in spiritual transformation in light of the structure of the soul, how the mind relates to belief-formation, how it sees, and how it relates to willing, feeling, and desiring. Chapter 4 and 5, which constitute part two of the book, are all about how to grow the mind, how to mature it and squarely deal with its “hobgoblins” and “cobwebs,” or as I so describe. I encourage readers to note and address the problem of the infantile, “empty self,” pride, and being controlling. I go on to say that if a mind is to be formed by virtue it must learn to cultivate wisdom and honesty, humility, faith and hope, vigilance and fortitude, and fidelity to God and His cause in this world. To help clear the “mental cobwebs,” my chapter 5 does helpfully provide a brief sketch of principles of logic and argumentation and an overview of various formal and informal logical fallacies. Chapter 6, 7, 8 and 9, provide a powerful, coherent, and an encouraging vision for what a mature Christian mind can look like when cultivated with evangelism, apologetics, and attentiveness to evidence for God's existence and presence in our world. In the newly developed chapters of 7-9, I try to offer an accessible, substantive and straightforward framework for not only thinking and helping others come to know that God exists, but to recognize how Jesus' resurrection is indispensable to understanding how God is real and present in our world. Chapter 10, which is also the fourth part of the book, offers a vision for “recapturing the intellectual life in the church.” This is a necessary call for any generation of Christians. In many ways, it helps to capture the heartbeat behind my own writings, and it certainly reflects a core motivation in my own life. I think a handsome compliment to this chapter is also Dallas Willard’s final chapter, “Pastors as Teachers of the Nations,” in his wonderfully inspiring book, Knowing Christ Today (HarperOne, 2009). In this chapter I try to offer very practical, clear, and helpful recommendations for how the church can be strengthen in her leadership, organization, practice, and mission. Ten years after Love Your God With All Your Mind was published, my book, Kingdom Triangle: Recover the Christian Mind, Renovate the Soul and Restore the Spirit’s Power (Zondervan, 2007) was released. In some sense, I think these two books are like demarcations in my book writing history or perhaps even book ends that start and continue different phases of emphasis in my writing on Christianity and contemporary life. Clearly, the former was pregnant with offspring for the latter and the latter seems to complete the former, but not in the sense of finish; perhaps extends it and helps it reach more of its own goal. Enjoy INTERESTING QUOTES from the book, and also purchase the inexpensive Kindle version! FREE Discussion Guide developed by Joseph E. Gorra. It is full of passionate and thoughtful vision and encouragement for how to grow the life of the Christian mind in persons and their groups. It helpfully and clearly teaches how the mind is integral to the life and health of the soul and its transformation in Christ. It situates the relevancy of logic and clear-thinking within a broader vision of being a disciple of Jesus. It has been time-tested and utilized by small groups around the world along with being a required text for many Christian Thought, Critical Thinking, and Worldview Introduction classes at high schools and colleges all around the U.S. It offers a compelling and practical perspective on the life of the Christian mind within the local church. It usefully shows how apologetics, evangelism and vocation are vital to the health of Christian thinking. 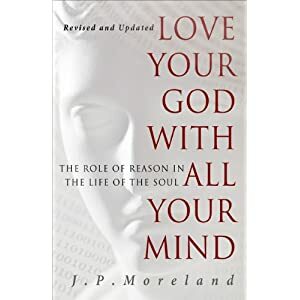 Endorsements: "J.P. Moreland exemplifies the Christian mind as it ought to be-tough and analytic, but also generous and caring. Christians who want to develop their minds in the service of Christ couldn't find a better teacher, or a better book for the task." --Phillip E. Johnson, author of Darwin on Trial "This is more than just another Christian book. It is the wake-up call that the church needs today. God gave us minds for a reason. It is crucial that we become like Christ in the way we think. If we heed J.P.'s words, we can counter the culture in which we live, work, think, and minister." --Josh McDowell, Josh McDowell Ministries --This text refers to the Audio CD edition. I am reading this for the third time, and now with news of an updated version, it looks like I will have four readings!